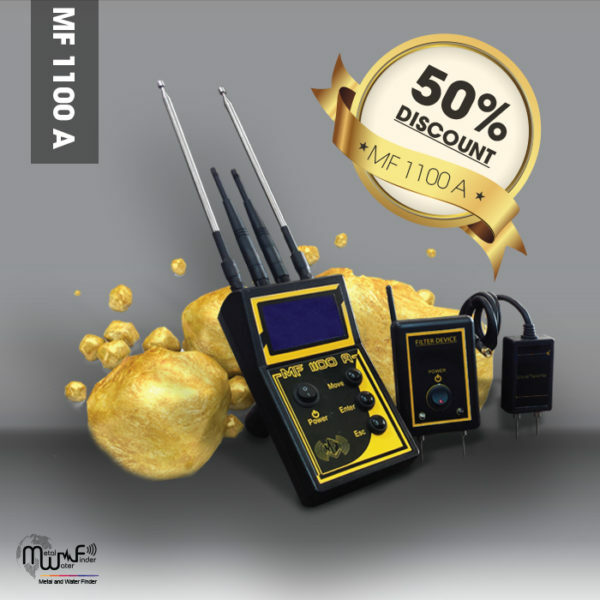 The modern device (MF-1100 a) Innovation and new technology , the most accurate research for gold, treasures, Metal and cavities underground, works the device to hunting and determine the locations of targets through transmitter and receiver Smart technology, Which provided in the researcher device (mf-1100 a ). The legend to locate buried treasure, enables you to leap into the future by long range detection systems. Control Panel keys easy to use and work. Device Software contains with several programs lists , appear in the screen to set up the device to search. Language List : English, French, German, Turkish, Persian, Arabic . Depth List to Determine the level of Search depth: 1m – 3m – 5m- 10m – 15m -20m . Distance List to determine the level of Search distance: 100 m – 500 m – 1000 m -1500 m.
Targets list: Gold, Silver, Bronze, Diamonds, Caves, Ore Gold, with the feature to selection the metal type before starting the search. The device works on a Two 9-volt battery enables it to work for 4 hours of work, can be change or recharge. Battery power level indicator (shown on the screen) . Automatic work in all soil conditions. Speed in determining the target location. Three of modern electronic antennas . Weight of the device is the 1 kg only. Two 9-volt batteries, First battery is responsible for the operation of the processor and software,Second battery is responsible for coordinating and sending waves. Gold, Silver, Bronze, diamonds, caves, Ore Gold .